With a focus of reducing the risk of damage from disasters and promoting high standards of development, the St. Mary Parish has developed a Unified Development Code. A major goal of the Unified Development Code is to improve the overall organizational structure and consistency in the Parish’s development codes. This new code incorporates Smart Growth principles and floodplain management to better prepare the parish, its communities, and landscapes for natural disasters as well as development pressures. To this aim, the code also includes form-based alternatives, such as TNDs, as well as other quality-of-life measures, such as sign and landscape regulations. Main Street, Franklin, LA. Photo by Piccor via Wikimedia Commons. 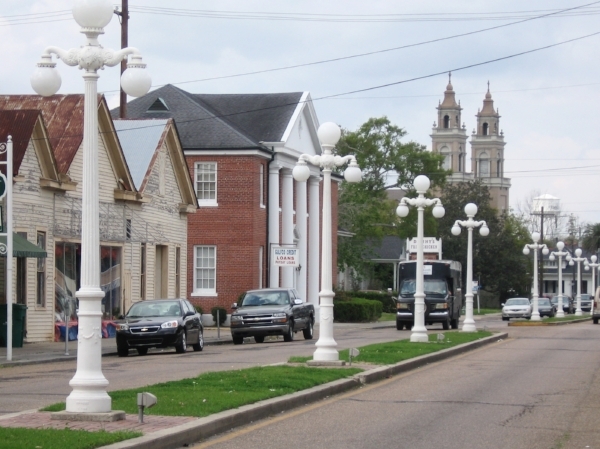 In 2002, St. Mary Parish prepared its first comprehensive master plan, which was approved by resolution in December of that same year. A major component of the plan was a first-time parish wide zoning ordinance. The Parish has since established a planning and zoning office, planning and zoning commission, and board of adjustment, as well as completed several amendments to its land use maps. However, the recent spate of storms has made the significance of planning and mitigation all the more apparent. St. Mary Parish is located in south Louisiana near the center of the state’s coastline. With its proximity to the coast and the Atchafalaya River, the Parish is subject to storm and riverine flooding throughout the year. In particular, the Atchafalaya River generates flooding in the region on a near annual basis during winter and spring. The Parish is also subject to stormwater events and backwater flooding resulting from the combination of riverine and surge events. State and Federal officials rated the Parish eighth in flood-related damages from Hurricanes Gustav and Ike. Due to St. Mary Parish’s geographical location, vulnerabilities related to climate change are increasing. Through the new Unified Development Code, the Parish has been able to integrate ordinances that mitigate flood hazards and design standards that promote appropriate density in specific locations. A key component to resilience planning is the integration of Hazard Mitigation and Urban Planning. St. Mary Parish is particularly vulnerable to riverine flooding, storm surge, and backwater flooding. The Unified Development Code includes standards that mitigate flood hazards to residential and non-residential structures by requiring certain mitigation activities. These regulations protect the natural environment as well as citizens’ property. The document provides opening specifications for enclosed, waterproofed structures, ie minimum opening requirements; location above grade, etc. St. Mary Parish employs a levee protection system to reduce its vulnerability to flooding. This requires careful consideration for how internal stormwater is managed. The plan acknowledges that it is in the public interest to control stormwater runoff increases due to construction and development activities, and protect from environmental degradation through soil erosion, stream channel erosion, and nonpoint source pollution. The Unified Development Code does several things to promote a sense of community and ensure quality development in safe places across the Parish. Aspects of the code include various design standards, construction standards for building in high risk areas, and new planning and economic development oversight entities for the region.